When a filling is required, Eugene family dentist Dr. Kirchmeier and his team can provide aesthetic tooth colored/bonded restorations. Closely matched to the color and shape of your surrounding teeth, this restorative dental care procedure protects your teeth while providing a beautiful smile. If you have received fillings over the years, Dr.Kirchmeier will closely monitor them for any signs of failure. After years of use, fillings can start to break down at the edges, which can lead to new decay or weakening of the surrounding tooth structure. Tooth-colored/bonded restorations are natural-looking fillings that prevent further tooth decay while strengthening weakened teeth. 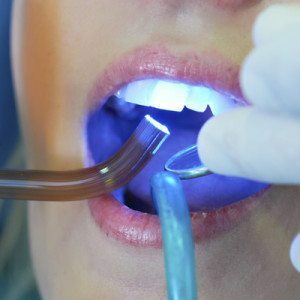 Generally completed during one office visit, this restorative dental care bonding procedure can significantly improve the appearance of a tooth. Composite restorations come in a variety of shades to match the color of the actual and surrounding tooth structures. At North Eugene Family Dental, Dr. Kirchmeier and his team will work with you to decide which restorative dental care option for dental fillings is right for you. 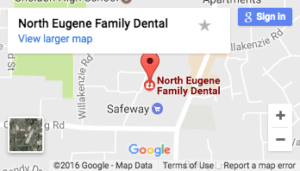 Our goal at North Eugene Family Dental is to provide dental work that is imperceptible. We exchange existing crowns and fillings with restorations that look and feel like your natural teeth. Fitting a crown requires two visits to North Eugene Family Dental. Initially, Dr. Kirchmeier will get rid of any decay, shape the tooth as needed, and then fit the tooth with a temporary crown. On the subsequent visit, Dr. Kirchmeier will remove the temporary crown, replacing it with a permanent crown. Once adjusted, if necessary, the permanent crown will be cemented into place and you have a new beautiful looking tooth. Side effects of missing teeth are an increased risk of gum disease, drifting and tilting of adjacent teeth and a decreased ability to properly chew our food. This trend can be minimized with a dental bridge, which is used to replace missing teeth. The bridge attaches artificial teeth to adjacent natural teeth, called abutment teeth. Fitting a dental bridge usually takes two appointments to complete. Dr. Kirchmeier will first prepare the teeth on either side of the space by removing a portion of the enamel and dentin. 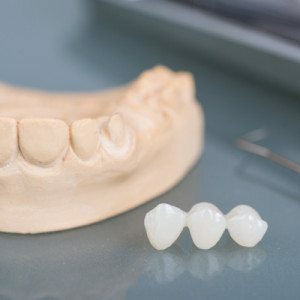 A bridge must be constructed precisely to guarantee correct bite and to match the opposing teeth, so impressions of the teeth are taken and sent to a lab. Between appointments, a temporary bridge will be provided to protect the teeth. 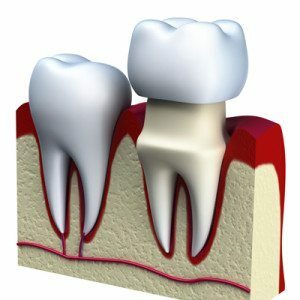 Crowns, which are cemented onto the natural teeth, provide support for the bridge. Fixed bridges are cemented to the natural teeth next to the space left by the missing tooth. A pontic (false tooth) replaces the lost tooth. A strict routine of brushing and flossing will keep the bridge and surrounding teeth clean. Good dental care of these teeth is critically important, as the bridge relies on the neighboring teeth for support.